Groundwater in Bengal Delta Plain (BDP; West Bengal and Bangladesh) is contaminated with geogenic arsenic (As). Shallow aquifers (<50 m) are largely affected with high arsenic which frequently exceed WHO guideline value (10 µg L−1). 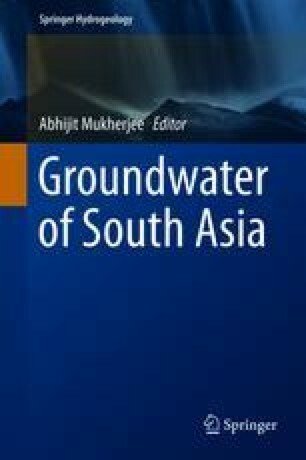 This large-scale “natural” arsenic groundwater contamination has generally been associated with strong to moderately reducing aquifer conditions of BDP like the As-affected areas of Nadia, West Bengal. The groundwater flow of the Holocene aquifers, is slow and sluggish with poor aquifer flushing. The deltaic sediments (from early-mid-Pleistocene–Holocene–Recent) are the major hosts for As. The geomorphologic features of Nadia are also important for As distribution. They are grouped into two major landforms, UDP (Upper Delta Plain) in the upper part of Nadia district and LDP (Lower Delta Plain) in lower part of the Nadia district. Both the landforms are adorned with several surface features. The arsenic content of the aquifer material is not regularly high (3–18 mg kg−1); however, the groundwater arsenic content is often exceptionally high (up to 1186 µg L−1). The most notable features of the groundwater are spatial heterogeneity and predominantly reducing conditions at near-neutral pH values (6.5–7.5) with high concentration of redox-sensitive species (notably Fe, Mn and As). Arsenic is released to groundwater mainly by desorption from Fe-oxyhydroxide/iron-bearing minerals (mostly coating on sand/mica) under local reducing conditions. The spatial as well as the depth dependent heterogeneity can be explained by the pattern of accumulation followed by random distribution of arsenic rich Fe-oxyhydroxide/Fe-bearing minerals in the aquifer sediments along with groundwater flow pattern. The issue of arsenic in the deeper aquifers is most challenging in regard to both the geological and public health point of view. All the affected Southeast Asian countries are now working hard to meet up with the WHO guideline value (>10 µg L−1) for community water supply. In this context, deeper aquifer is the most reliable source of safer water as remediation technologies are in many cases incapable of yielding arsenic-safe water.